Vaughan Williams’ first encounter with John Bunyan’s The Pilgrim’s Progress was as a young child when the story was read to him in the late 1870s. Not surprisingly, the moving prose, gripping story and vivid imagery stayed with him. It was over seventy years later that the complete opera, or ‘Morality’ as the composer preferred to call it, was first performed at Covent Garden. Vaughan Williams had a lifelong connection with, and fondness for, John Bunyan’s Christian allegory, “The Pilgrim’s Progress”. It was read to the composer as a child two hundred years after it was written in the 1670s. In 1906 Vaughan Williams composed music for a local dramatization; in 1922 he set a “Pastoral Episode” from Bunyan’s allegory as part of The Shepherds of the Delectable Mountains; and in 1951 he completed what he called a “morality” with the same name as Bunyan’s “The Pilgrim’s Progress”. What we hear on this recording, though, is the incidental music that Vaughan Williams wrote for a radio play and which was performed at the height of the Second World War, in 1942/43, at the same time – somewhat surprisingly – as the sublime, peaceful Fifth Symphony was being finished. Ralph Vaughan Williams, once almost cornered as a mere pastoralist, was actually a composer capable of great profundity. He could respond with vision to that unique blend of the apparently plain and strikingly trenchant with the teasingly symbolic in English poetry and prose. One thinks of the composer’s settings of the Bible and Blake, for example. Britten had a similar gift. Bunyan’s text itself had such qualities. The author wrote this incidental music in an utterly allegorical way too. Yet it was also capable of being received literally – burdens, journeys, moral, immoral and amoral iconic and emblematic characters, places and ideas made concrete. The metaphor wraps us up in its own logic. It was Edward Sackville-West (1901-1965) who arranged Bunyan’s text for the radio. Equally at home in music and literature, Sackville-West joined the BBC in 1941. He was held in unusually high esteem as a producer and musical assistant. But enlisted the help of the actor and theatre director, Walter Nugent Monck (1877-1958) who had prepared a play of the work in 1932 for this production. Unlike Vaughan Williams’ later opera, The Pilgrim’s Progress, the result of this collaboration between Sackville-West and Monck was a somewhat uncomplicated distillation of Bunyan’s text without references backwards or forwards, comment or dramatic “numbers”. Actors and singers take the largely spoken roles of narrator (Bunyan), Christian, the Evangelist, and ten of the allegorical characters. In completely unadorned fashion and without effects or “stagery” Bunyan’s work unfolds over 90 minutes – much of undeclaimed – with the addition of Vaughan Williams’ music; some of this is redolent of the canon in the Tallis Fantasia, and the aforementioned (last slow movement of the) Fifth Symphony, and Job. Other is new, some slight, none histrionic, some to enhance a feeling – of danger, joy; or to implicitly illustrate character, as is the case in Job. Vaughan Williams has not written film music here; although it’s doubtful whether much of what we hear could really stand in its own right; or would make a convincing concert performance. Somewhat surprisingly Vaughan Williams admitted (to Adrian Boult, the first conductor) that the score was “… very carelessly written”. Boult, though, did not return it to the composer for correction, as asked; so time had to be spent during rehearsals to make it effective. Listen carefully and it is possible to detect gaps, places where music might have added impact or supported an emotion or character, though rarely an event – for that was not Vaughan Williams’ intention. This two-CD set necessarily provides an excellent insight into the way in which a few generations ago the BBC could collaborate with composer, musicians, dramatists and the classic authors to produce a “document” of real worth without the need for gimmicks or apologies, as is the practice nowadays. The performers are committed without over-playing the many climacterics even of the “Pilgrim’s Progress”. John Gielgud is, of course, his usual commanding self; and that long-time stalwart, Carleton Hobbs, stands out, as does Julian Somers. Some of the accents remind one of the “cut glass” delivery which has been lampooned by those for whom such command and clarity seem unnatural now. The orchestra is eager yet business-like; the singers and chorus remain restrained yet clean and colourful throughout. It is to be remembered, though, that this is first and foremost the adaptation of a seventeenth century exploration of human struggle in allegory which is spoken as mid-twentieth actors understood it; with supporting music from an admittedly sympathetic composer. Not a through-composed opera. 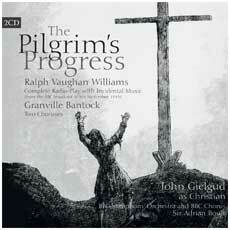 The first two tracks on CD 1 are two choruses from “The Pilgrim’s Progress” by Bantock. They were commissioned by the BBC for the tercentenary of the birth of John Bunyan in 1928. On a grand Elgarian nobilmente scale, they too are very much of their time… the recording from January 1929 actually stands up quite well. Though inevitably boxy and distorted, they make a good supplement to the main work. The acoustic of Vaughan Williams Incidental Music to “The Pilgrim’s Progress”, while showing its age and origins, is surprisingly good for a recording over 70 years old. Albion Records is to be congratulated on the project of making available this interesting episode in what counts as much as radio history, really, as pure music. The booklet, which contains the full text and brief bios of Gielgud, Robinson and Boult, has illuminating and helpful essays by Stephen Connock of Albion and the RVW Society on the genesis and production of the work. This is a CD likely to appeal to two (possibly overlapping) constituencies: those who want the complete output of Vaughan Williams, and those who remember a style of music-making (on the radio) now long gone. Provided they appreciate that it is on the spoken word where the focus of these CDs must fall first and last, and that the music is indeed “incidental”, they will not be disappointed.